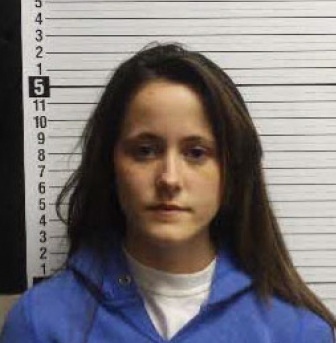 Teen Mom 2’s Jenelle Evans was taken into custody late Sunday in connection with two misdemeanor charges of simple assault and simple affray and we have her just-released mug shot for you. The arrest stemmed from a video of Evans, 19, fighting a love rival named Britany Truett over a boy named Kieffer Delp, who was also arrested Sunday on an unrelated outstanding drug charge. In the clip, Evans is seen punching Truett (who’d pressed charges over the weekend) repeatedly in the face. The North Carolina native – who’s forfeited legal custody of her son Jace to her mother Barbara in this season’s edition of the MTV reality hit – was apprehended by Oak Island Police and booked into Brunswick County Jail, where she was released at 11:25 p.m. ET on bond of $500. Truett, the victim in the attack, was charged with one count of simply affray; her bond was also set at $500. Evans is the second Teen Mom in as many seasons to be arrested based on incidents caught before the show’s cameras, as Indiana native Amber Portwood is currently facing a pair of felony charges in connection with her televised attack on baby daddy Gary Shirley. Evans will face the charges in court April 26; Is fighting and getting arrested the only way these trailer trashers can get attention? Paris Hilton Mug Shot – One of The Prettiest We Have Seen!